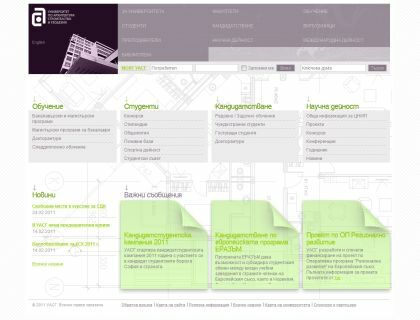 The website of the University of Architecture, Construction and Geodesy (UACEG) presents a new, rich and intuitive structure of the information about the University, aimed to the main user groups - students, professors, employees, etc. The website integrates data from three separate internal university systems - students system (SUSI), ECTS packages for each program, and the old university website with its system for personal professor pages, so the result is a unified bilingual system, which can be a good basis for the future information system. The website allows the students and professors to access information, visible only for them or for specific user groups. Students can review their personal data, semestre records and examinations and access the materials for each of the disciplines, stydy and exam schedules. Professors and employees can post information in their personal profiles, submit materials for each of their disciplines, review the list of students for each major and course. The administrators for each department, faculty, center in the University can update their specific information, publich information and submit news in the respective sections of the website. We all hope that all professors and employees in the university will help with submitting useful information in the website so that the result will be a really good and useful website.